Planet Dog, the designer and developer of dog products has added the newest teammate to the sport line — the Orbee-Tuff Basketball. 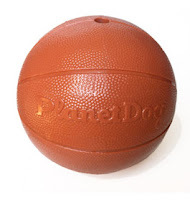 The 5” Basketball features doggie-durable Orbee-Tuff “leather” with raised bumps and seams for authentic texture. It is rated 4 out of 5 Chompers on the Durability Scale, making it a slam dunk for the larger dogs on the team. The product sells for $18.95.